NEWBURY, Ohio, Dec. 6, 2018 /PRNewswire/ -- Ralston Instruments, a leader in the advancement of pressure calibration equipment, has just released the Ralston Quick-test™ USN line of hoses & adapters. 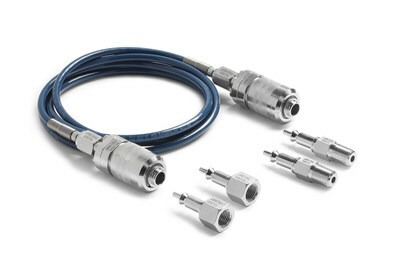 Made in the USA from military-grade 316 stainless steel, the new USN adapters provide access to existing high pressure ports with a click-in, click-out quick-connect without the threat of accidental disconnection. System pressure locks the quick-connect to eliminate disconnection while live pressure puts the technicians at risk. According to Doug Ralston, Senior VP, Engineering, "The unique design of the USN line offers secure, safe, time-saving connections under very high pressure, just like a standard quick-connect sleeve. In the past, this would have been impossible without a threaded connection that required a wrench or thread sealant. This technology was designed for the Navy, but there was obvious crossover into the commercial market. We are excited to take that next step."